Today is Garden Bloggers Bloom Day, hosted by Carol at May Dreams Garden, in which we are encouraged to put on parade what is blooming in our gardens. I really had hoped to participate regularly this year, but I am sad to report that due to the unfavorably frosty conditions in my garden, I have almost nothing to display for this first GBBD of the year. Most of the flowers in the garden look like this brown camellia blossom. There were a surprising number of buds on one of the Encore azaleas ready to open, but the frost killed them. I would have expected the iphaeon to be starting to bloom now; it has reliably done so in past years. The greenery of the foliage is there, but no buds yet. Even the violas and pansies have not yet recovered from the frost. 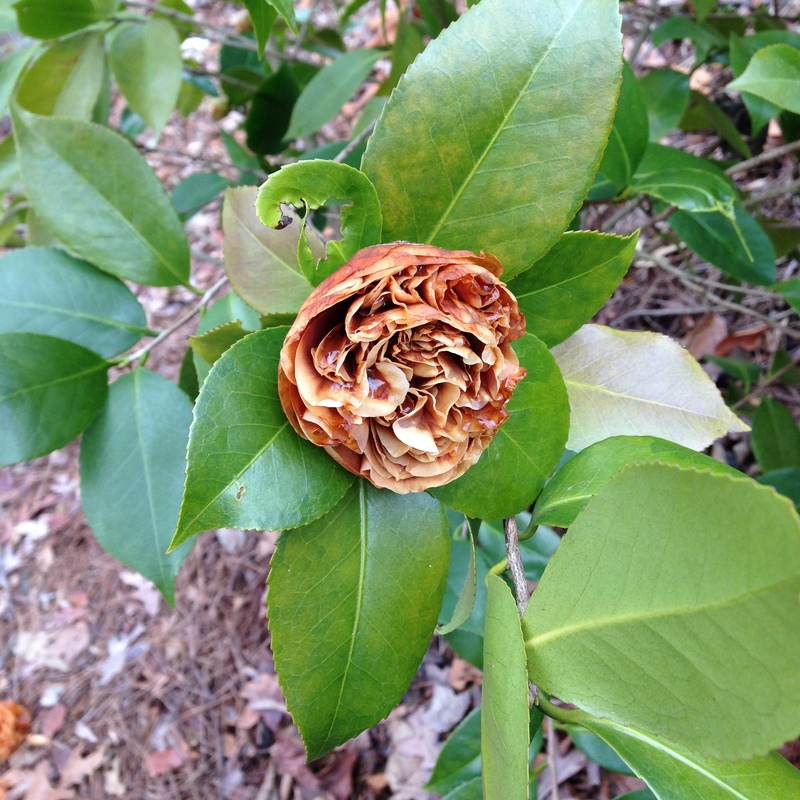 ‘Governor Mouton’ Camellia japonica is loaded with undamaged buds, is showing color at their tips, but still no openings. The only items I could find with any color at all are a recovering and “weeping” pansy and a few struggling and well hidden loropetalum blossoms. I do hope Carol will forgive this puny effort. At the least, I tried! This entry was posted in Gardening, GBBD and tagged Camellia japonica, Carol, Garden Bloggers Bloom Day, Governor Mouton, loropetalum, May Dreams Garden, pansy. Bookmark the permalink. 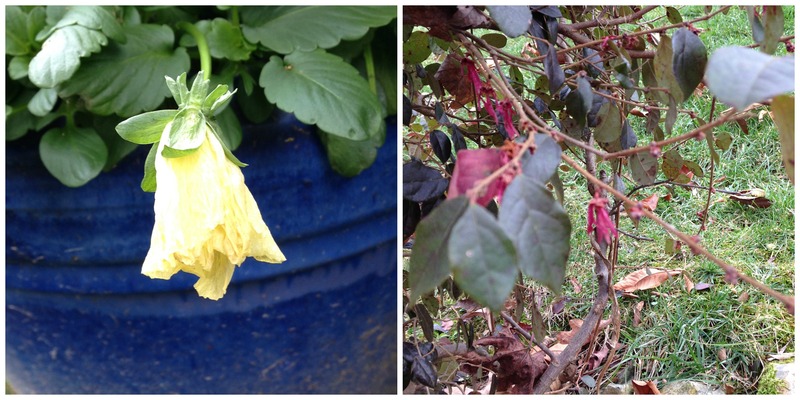 22 Responses to Garden Bloggers Bloom Day–1/15/2015: What a Bust! Oh, that’s too bad! I’m sure February will be better for you! We in the north have to resort to our houseplants for winter Bloom Days! Thanks, Kimberley. 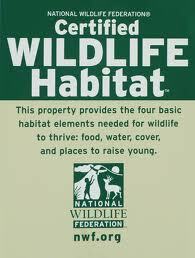 I may have to resort to house plants as well if things don’t improve here. It’s been really cold just about everywhere. Even my pansy plants that usually bloom all winter are struggling just to stay alive. This morning we had what the weatherman calls “wintery-mix” but, thankfully, it didn’t last long. Next month will be better! Thank you , Lea. We haven’t had a “wintery-mix,” but the extended mornings below freezing have had a very negative effect. This too shall pass. Could be worse, you could be here where everything is frozen. On the other hand, it is really frustrating when buds ready to pop are ruined by the weather. You have my condolences. I appreciate your understanding, Jason. I’m sure it will get better, but it is so frustrating now. As you know, I feel your pain. Fingers crossed for February. Thanks, Marian. I know it will pass and the sun will come out and we will be happy again. I just wish it would hurry up. Unpredictability of winter. Let’s hope February is kinder. Thanks, Susie. Let’s hope together. Oh dear, I am sorry. How depressing for you. Gardeners should get a special dispensation from winter. I don’t think non- gardeners could understand the pain. I hope you get some flowers for February’ s bloom day. Thanks, Chloris. I can hardly wait for February. Better luck for February, John! I’m actually even worrying about my own garden in summer, now I’ve started taking part! I have lots of things that just repeat and others that are too small. But it’s an interesting record, isn’t it? Happy GGBD! Interesting, indeed. And thanks, Cathy, for the good wishes, and the same back at you. The good thing about all the plants you showed is that they hold back some buds, lots of buds, for a warmer day. Every year is different. This time last year I had deciduous magnolia blossoms. Thanks, Nell Jean. You are correct in saying every year is different. Daffodils have bloomed every year we have lived here at the entrance to my grandkids neighborhood by the first of the year. This year no. But I do see the foliage has poked up. Hopefully you will have lots more flowers when your weather warms up a bit, weather is the only thing that we can’t predict for our gardens. I keep saying “there’s always next year” when something doesn’t go to plan. Hopefully next month will be better. I share your optimism, Pauline. Today is sunny, much warmer, and the birds are chattering about. I think yours was a heroic attempt! With Mother Nature we sometimes don’t win. As others have noted, it is especially painful when burst-ready buds freeze off. In that regards, I have been far better off this year than last. Best wishes for you, for February! Thanks, Anna. I appreciate your good wishes, and with each warmer day, I gain in optimism. My pansies would trade places with yours in a minute, they look far worse and can’t even think of blooming yet. Glad you gave it a try though! I’m sure February will be better. Thank you. My spirits rise with every few degrees up.